fruit knife, later fruit fork. It was used to peel and carve fruit. 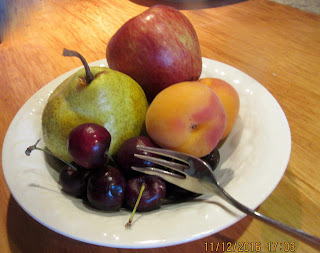 It is supposed that fruit forks are an invention of Enrique Villena in Spain who claimed them legal because fruit comes from a plant, not an animal (see tenedores and Villena). The one described by Villena looks like an under grown sword with a hilt as long as the width of the hand, a cup-shaped guard and instead of a blade, a wedge that is half a finger length and the diameter of the baby finger. It was used for peeling fruit and eating quince, pears and apples. Then it was silver or gold. This developed into the two or three prong fruit fork, also called the ‘feminized toy’. In 1434, during the tournament held by Suero Quiñones at el Paso Honroso just outside the city of León, they were supplied to guests with dessert and were the novelty of the day.